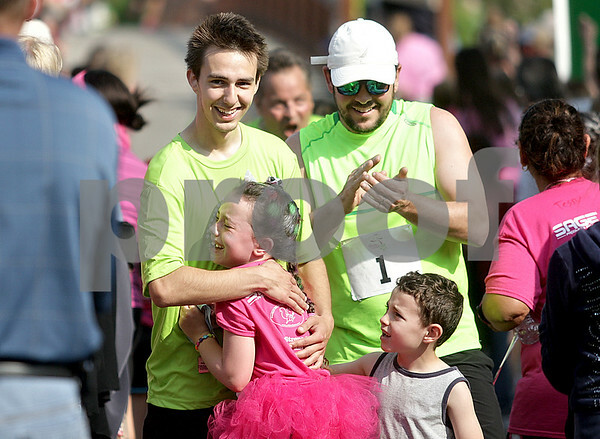 Fourth grader from Somonauk Elementary School Anna Valela receives a hug from her running buddy and brother Peter Valela Jr. and congratulations from her father, Peter Valela, and little brother, Asa Valela after completing the area's first Girls on the Run 5K race at Hopkins Park in DeKalb on Saturday, May 18, 2013. Girls on the Run is a national program that encourages girls in grades 3-5 to avoid gossiping and bullying and promotes making better, heathier decisions. Around 111 girls ran the race along with their running buddies and other community members.